LA or Los Angeles is called the City of Angels. I believe in Dalai Lama's quote- "Once a year, go someplace you've never been before." Haven't visited LA yet & dreaming to visit LA soon. My Uncle & Aunt, Cousins & friends stay in LA & have been inviting me to visit them! 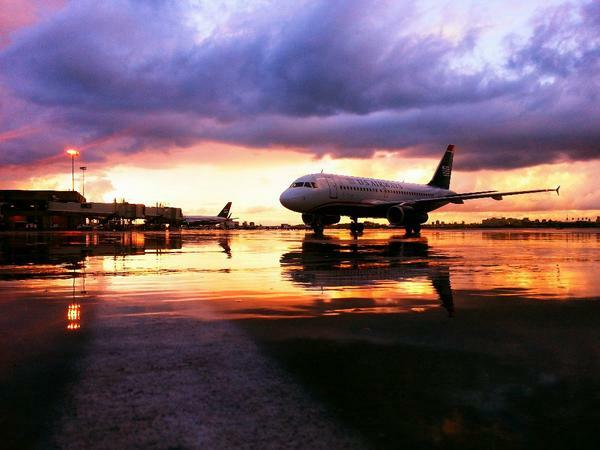 I really wish to visit LA & fulfill my promise of meeting my loved ones there. 2. To visit the UCLA -University of California, Los Angeles Campus. I'd love to visit "the grounds of optimism" that have gifted "12 Nobel Prizes, 12 Rhodes Scholarships, more NCAA titles than any university and more Olympic medals than most nations." Optimism is in my DNA too & I have to visit UCLA! 3. To visit the Walt Disney Concert Hall. I love Music & Walt Disney & I can't miss this home of the Los Angeles Philharmonic orchestra and the Los Angeles Master Chorale. 4. To visit the Vincent Thomas Bridge. It would be great to visit this 1500-foot long suspension bridge crossing the Los Angeles Harbor. I'll click pictures at the first welded suspension bridge in the United States. 5. To visit the Griffith Park. It will be lovely to spot the butterflies in this large municipal park. I would love to see the famous Griffith Observatory. 6. To see this giant rubber duck that is six stories high! I am excited to read about the Tall Ships Festival Los Angeles 2014. How wonderful it'll be to see this! 7. To visit Getty Centre. I would like to visit this campus of the Getty Museum and other programs of the Getty Trust. The Getty Museum is a treasure-house of pre-20th-century European paintings, manuscripts, sculpture, arts and 19th & 20th-century photographs. 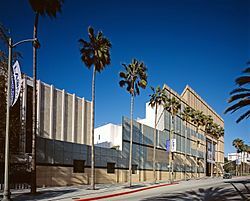 LACMA is the largest art museum in the western United States. The art-lover in me will be happy to see the rich works of art from ancient to modern times. I am a HUGE Movies Fan and dream to visit Hollywood- the home of the entertainment industry. 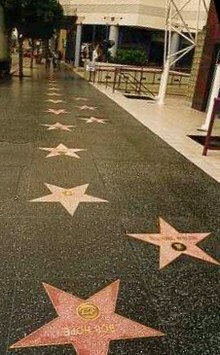 I would love to visit the Hollywood Boulevard & Vine Street for the Hollywood Walk of Fame & the El Capitan Theatre. A real treat with more than 2,500 five-pointed terrazzo and brass stars embedded in the sidewalks in the ground... The stars dedicatedly bearing the names of the Who's Who of the Entertainment Industry- actors, directors, producers, musicians & groups, fictional characters, and others. 10. To visit the DreamWorks Animation Campus & a tour of their Studios. 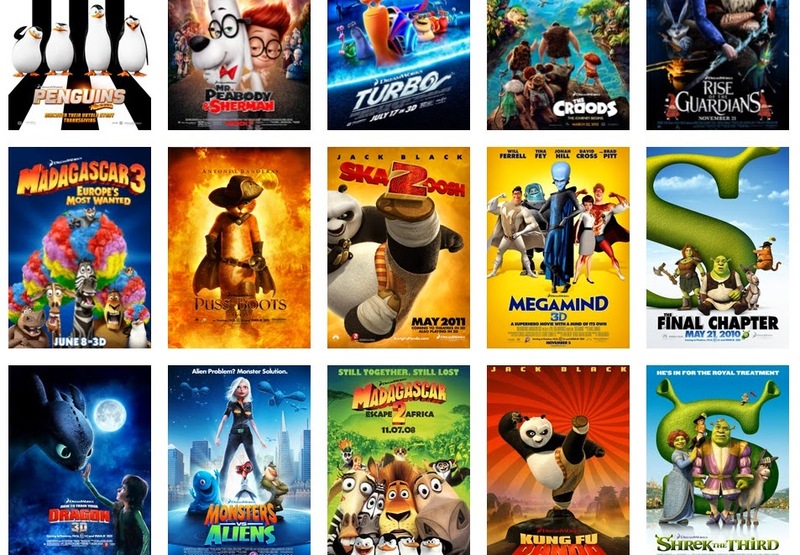 I have absolutely loved all their super fun & super cool animation movies that I have had the privilege to watch! Do read my Post- I Am A World Explorer! I would love to see the place where there is so much talent & creativity! Taking a tour of the DreamWorks Animation Studios would mean a lot for me! 11. To visit the other Sights Of Interest in LA that I am forced to exclude as this is a "12-MOST" list! I will take expert suggestions & visit other must-see places of attraction too! 12. To attend the Social Media Week at Los Angeles! I love Social Media. I believe- Social Media has the power to change the world. Attending the Social Media Week at Los Angeles will be a great opportunity for me as I will get to hear and interact with the top Social Media Professionals from around the world. As a Blogger, Writer, & Social Researcher, I can share the valuable lessons, learnings & experiences. Here is my #SMWCreative Photography Submission. I have shared my pic & poem in my Blog Post too-King & Queen In God's Own Country. Now this Angel is ready to land up at the City of Angels! Los Angeles! Here I come! Note- The above 12-MOST list is in no particular order & I want to visit all what I have listed & more in LA! Hey! I hope you fulfill ur dreams of visiting LA soon. It's a dream destination for me too and wouldn't mind making my life there. Thanks Vishal for your wishes. best of luck for ur LA tour!! Yes, even Las Vegas is on my list! Best wishes for your coming trip to LA! It is a lovely city with numerous places worth seeing. Long back i visited a few of the places mentioned in your list. Fantastic it was, to say the least. First, let me get to go! I hope my attempt to post a comment succeeds at least today! Thanks a ton for such nice words, Vidhya :) You don't have to be sorry, dear! Your words make me win! Now I know what to do the next time! Voting does count, but only for the entry with the highest votes! The Judges will select too. A lots of best wishes for you Anita! Its a lovely dream I wish your dream come true very soon . I have visited LA before my chinatown bus nyc to providence tour. After visiting your thread I know about your traveling interests. I think you have a great passion just like me. I am tourist and traveling is my hobby after visiting your blog I am planning to visit there again and enjoy the beauty of LA under your recommendation. Any suggestion or a tip that you would like to share with me. Thank you so much for stopping by, Faikka. Meanwhile, as you have already visited LA once before, why don't you visit the Eastern part of the World now? Incredible INDIA is a wow place. Do plan your visit now. You will be amazed as our whole country will be lit up on October 23rd 2014 on the occasion of Diwali- the Festival of Lights. You can have delightful desserts & sweets & yummy treats too! Anita! You are right I am interested to know about the things about India. I have a little information about it, If you will shares some top Indians attractions and the events that are popular among the tourist and the locals. I curious to know something special about the India. India has many attractions.... so many that this comments section & this Blog isn't enough! Here, a tourist can find so much. Depends on what you are looking for. Do share if you have anything particular in mind.